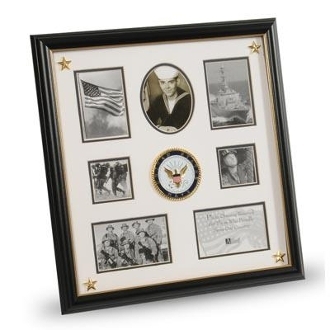 U.S. Navy Medallion Collage Frame with Stars is designed to hold 7 pictures. These pictures are set into a double layer of Navy White matting with Gold trim. Each corner contains a golden star for added detail. The frame is made from Black with Gold Trim colored wood, and the outside dimensions measure 18-Inches by 19-Inches. The U.S. Navy Medallion 7 Picture Collage Frame with Stars is perfect for proudly displaying the pictures of an individual who is serving, or has served in the U.S. Navy.